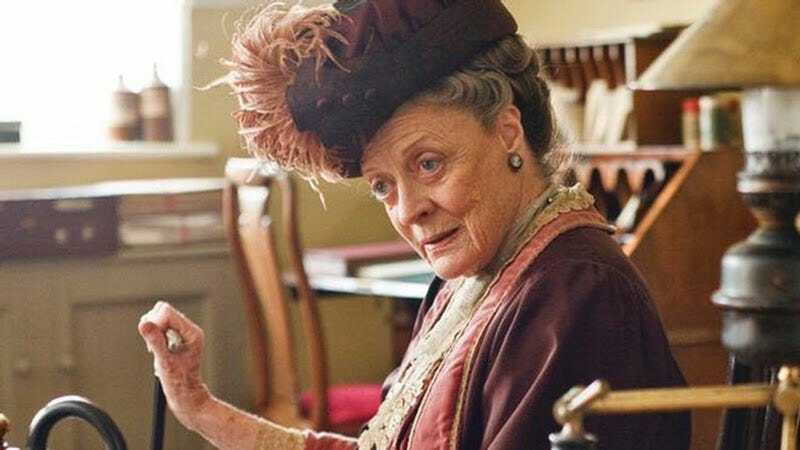 If you happen to run into actress and beautiful spirit Dame Maggie Smith at the gas station or where ever it is you two hang out, don't try to gossip with her about her hit show Downton Abbey because she hasn't ever seen it. When asked on 60 Minutes whether or not she was proud of the show, Smith hesitated, saying, "Yes — Well, yes, of course I am. I was just thinking — pausing — because I haven't actually seen it. I don't sit down and watch it." Asked why, she responded, "I will look at it when it's all over, maybe, because it's frustrating. I always see things that I would like to do differently and think why in the name of God did I do that?" So what does she get out of it? Well, dummy, "It's the joy of acting." Maggie Smith obviously has better things to do than watch Downton episodes all day (she has transfiguration lessons to plan). Grandmama Martha Levinson, on the other hand, always sits down to watch it because it's the more modern and American thing to do.